Just 2 hours south of Nashville is one of only 3 places in the U.S. where your family can see rockets, explore the history of NASA and see what is being planned by the U.S. going into the future of space exploration. Take a day trip and check out the US Space and Rocket Center in Huntsville. Make sure you have a full day available to visit the US Space and Rocket Center. There is easily 8 hours of things to see and do. It’s also worth waiting for a nice day – the exhibits are both inside and outside. There are also a few rides that are included with admission, but they do not operate in cold temperatures. The Center is divided into two buildings and a large outdoor area and doesn’t have to be explored in any particular order. Start your visit by walking through the gift store to the ticketing area. In addition to general admission for museum exhibits, you can also add tickets to see a movie at either the center’s IMAX dome theater or 3D digital theater or both if you have time. You can also purchase separate tickets to take a 2 hour bus tour of the Marshall Space Flight Center. You will be given a schedule for the day you are visiting with all the show times, demonstrations and guided tour times so you can plan your day. Check the operation times for the simulators and also get timed tickets for the Apache simulator when you purchase your tickets. Past the ticketing area is the Discovery Theater, where staff do live interactive presentations about life on the space station. 30 minute shows are scheduled through the day and worth seeing. Continue through the building and check out the Mars climbing wall. There are 12 stations to climb with increasing difficulty. You can stand in line and take as many turns as you like. Kids and adults are able to give it a try. Next you can see the Team Redstone Exhibit which showcases advancements in rocket weaponry and looks at the future of warfare. There are 2 simulators that are both included in your admission. Check the operation times when you purchase your tickets. The Mars Simulator seats a large group in a capsule and then a movie is shown as you move around. The Apache helicopter simulator only seats 2, riders must be 13 or older and it is recommended that you get a timed ticket to ride when you pay for admission. The rest of the exhibit area is reserved for traveling exhibitions. We have seen models of Leonardo Di Vinci’s machines, participate in an indoor GPS game and experienced an exhibit of the top 101 inventions that changed the world in the three times we have visited the Space Center. Find out what the current exhibit is HERE. The second wing of the main building has a full service cafeteria with some great options for lunch. It is also the Mission Center Complex for Space Camp. Depending on when you go you can watch some of the activities the campers participate in. There are also some interactive computer games and simulators. Spent some time outside and see Rocket park where you can see and even walk under some of the rockets that have been developed in Huntsville. There is also an area with a life sized lunar crater and lunar module. Back toward the main entrance and parking lot is Space Shuttle Park where you can walk around and under Pathfinder, a full size shuttle simulator. There are 3 rides outside. All are included with admission, but the temperature must be above freezing for them to run. The kids Cosmos play area for children 8 and under has a climbing area and a small ride just for the little ones. There is the G-Force Simulator that spins so you can experience increased G forces just like the astronauts feel during lift off. The space shot simulator lifts you into the air and then drops. Toward the entrance of the second building – the Saturn V Hall, is the Apollo Courtyard. Circling an upright Saturn V rocket are plaques commemorating each of the Apollo missions including Apollo 11, the first manned mission to the moon. In the center of the hall is a Saturn V rocket suspending on its side which you can walk under and explore. Exhibits flanking the walls tell the story of the Space and Rocket Center and the history of America’s space program. There is a small indoor play area for younger kids. And the hall also houses the 3D digital theater and concession area. After a full day of fun and exploration you can continue your adventure online at home with the NASA Kids’ Club website for FREE. Geared at elementary students, play games and learn about science, technology and math. Check out additional admission packages available for IMAX movie combos, bus tours, online tickets purchases as well as discount options for seniors, military, college students HERE. 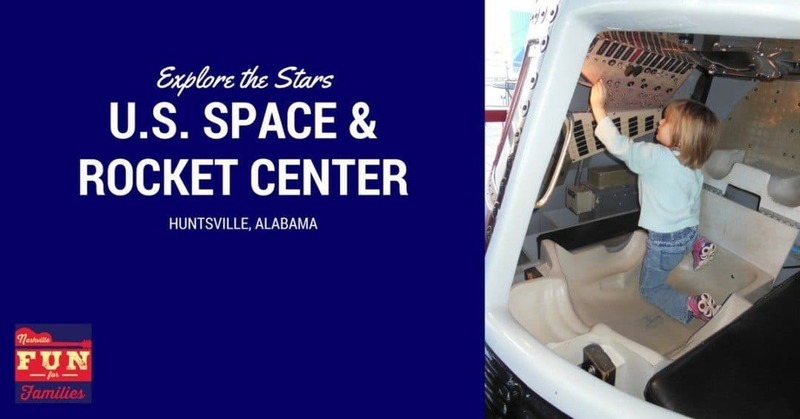 The Space and Rocket Center is in a consortium of museums, so check to see if your membership elsewhere (like Nashville’s Adventure Science Center) will get you free general admission.